The growing awareness about the water-borne diseases has augmented the demand for water purifiers across India. The uptake of water purifying technology is also expected to increase as growing number of consumers are expected to realize the benefits of consuming cleaner water. Owing to these reasons, the India water purifier market is expected to reach a valuation of US$4.1 bn by the end of 2024 as against US$1.1 bn in 2015. During the forecast years of 2016 and 2024, the overall market is expected to register a CAGR of 15.4%. India water purifier market is being fuelled by increasing awareness about the benefits of pure water, rampant urbanization, booming industrialization, and government initiatives through various policies and campaign about advantages of consuming clean water. Despite the strong market drivers, the challenge of educating the masses about the efficiency of these purifying technologies across rural India is expected to restrain the market. A huge chunk of the population still relies on boiling water to ensure purification. However, the rising adoption of water purifier in urban areas of India is anticipated to open up lucrative opportunities in the market. 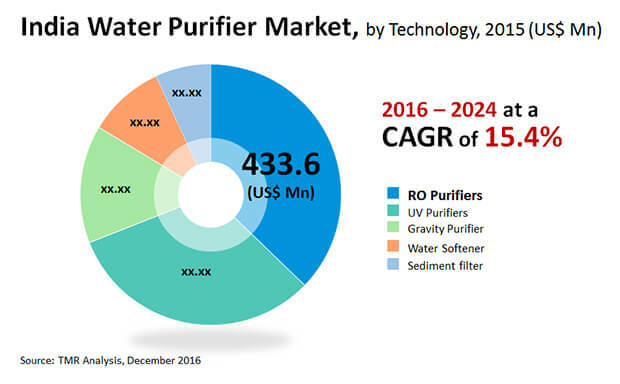 The various technologies available in the India water purifier market are gravity purifier, RO purifier, UV purifier, sediment purifier and water softener. The RO technology held a lion’s share of about 37% of the total market in terms of revenue, in 2015. Analysts anticipate that the gravity purifier is expected to exhibit a steady growth rate during the forecast period as the rural areas of India will incline towards using this technology. On the other hand, the water softener technology will register continuous growth as growing number of consumers are investing in RO and UV technology. The various accessories sold in the market are faucet mount, water dispenser, under sink filter, pitcher filter, and shower filter. In 2015, water dispenser held a leading share in the overall market, accounting for nearly 30% of it. In the coming few years, the pitcher filter and under sink filter are also projected to show a noticeable growth rate. The three end users of water purifier technologies are the household, industrial, and commercial sector. In 2015, the household segment accounted for a share of 55% of the overall end-user segment. This segment is expected to retain its dominance in the coming years as the demand for affordable and clean water in India household continues to be on the rise. Additionally, the demand for commercial water purifier technologies and solutions will also gain momentum as several small shops, cafés, and public places in India are complying to government initiatives of creating an availability of purified water across the country. The key players operating in the India water purifier market are Whirlpool India Ltd. Hi-Tech RO Systems, Essel Nasaka, Eureka Forbes, Kent Ro system Ltd., Godrej Industries Ltd., Panasonic India Pvt. Ltd., Brita GmbH and Kaz USA, Inc. The market is quite consolidated due to the presence few leading players. However, in the coming years, the competition is expected to get stiffer due to the introduction of several small and local players. India is a long-term sufferer of water shortage, and quality issues, particularly with respect to its bumpy territories and remote towns. This is forecasted to be a prepared development stage for players to gain by. Moreover, remote government bodies holding hands with the administration of India could give a solid lift to the India water purifier market. For example, the Sverdlovsk Russian area and India have settled upon a couple of water purging and treatment ventures to address the water needs in the nation. As per the analysts, the India water purifier market could be isolated according to three vital parameters, i.e. innovation, frill, and end client. It is imperative to comprehend the development of each fragment so as to channelize the business the correct way. The majority of the drinking wellsprings of water contain an abnormal state of dangerous elements because of spillage of overwhelming industrial contamination and rural activities. Lead is the most widely recognized harmful material found in drinking water and can cause mind and nerve harm. The interest for water cleansing advancements in India is relied upon to see a noteworthy ascent as family unit and different buyers turn out to be progressively mindful about the distinctive kinds of pathogens and pollutions exhibit in the water provided to them. This awareness moved down a few government activities executed to manage national wellbeing has examined to be very articulated in the remote and underprivileged areas of the nation. As more number of buyers wind up noticeably mindful about water-borne sicknesses spread through the convenient utilization of water, the more the request in the India water purifier market is anticipated to enlarge. Of all the three essential end clients in the India water purifier market, family could round up a huge income while riding on a twofold digit CAGR as a result of the raising need for unadulterated and reasonable convenient water. While there are different advancements making a stamp in the market, bright (UV) refinement and reverse osmosis (RO) filtration are imagined to feature a noteworthy development because of their most extreme sanitization ability. With the assistance of the layer innovation, RO decontamination can annihilate germs and different types of broke down salts from water. Therefore, the RO innovation is anticipated to enroll a telling development in the business. Slowly and gradually the urban areas of India are getting much more aware about the usage of varied water purifiers in the coming years. Notwithstanding, it is the provincial areas that could experience the ill effects of utilizing the most recent types of water sanitization innovation. In any case, other than the legislature, different multinational and private firms have assumed the liability to convey water purifiers to every single home in provincial India. In addition, there are mindfulness projects and activities being executed to instruct the provincial populace of the nation. Another test could be the fluctuating water textures that makes it trying to sanitize water at various levels. In any case, there are advancements being done that could counter test by taking into account the need of disposing of total dissolved salts (TDS) in specific regions of water types. Eureka Forbes, Ion Exchange, Adhunik, Aqua fresh, Filmtech, Kelvinator Quanta, LG Electronics, Mannya Grand Plus, Okaya, Panasonic, Sajal, Ventair, Hindustan Unilever, Kent RO, Whirlpool, TATA Chemical, 3M, Apex, Expert, Godrej, Krona Liquetac, Livpure pep plus, Nasaka Xtra, Own, Propello Uno, and Secure Water Purifier are some of the major firms dominating the Indian water purifier market.